From left, Tanya Sinclair, CEO for the Pickering Public Library, Jason Tafler, founder and CEO of Unyte, and Shelley Parker, an industrial psychologist with NB Power, talk about ways to manage stress at work during a panel discussion at the 2019 Employee Recommended Workplace Award event in Toronto. It was an event in the personal life of Tanya Sinclair, chief executive officer of the Pickering Public Library, that led her to re-evaluate the state of her workplace’s approach toward employee mental health. When a close friend’s son, once an “all-star in high school,” went off to university and began to show symptoms of a developing mental illness, she took a look around and realized it was time for the Pickering Library to adopt new workplace wellness standards. Between 2013 and 2014, Ms. Sinclair turned to the framework provided by the National Standard of Canada for Psychological Health and Safety in the Workplace, which lists 13 psychosocial factors that affect workplace wellness, including organizational culture, workload management and engagement. The library developed a wellness committee and began to roll out programs such as employee wellness surveys, dog therapy and yoga. Ms. Sinclair says she is glad her workplace looked into these issues when it did. Just one year after the library became an early adopter of the standard, an employee died rather suddenly – putting the organization’s skills in handling crises to the test. “If it wasn’t for all of the training that we had undergone in our workplace with our employees and our leaders, we would not have been as well equipped to deal with the sudden loss of a very close co-worker,” she said. 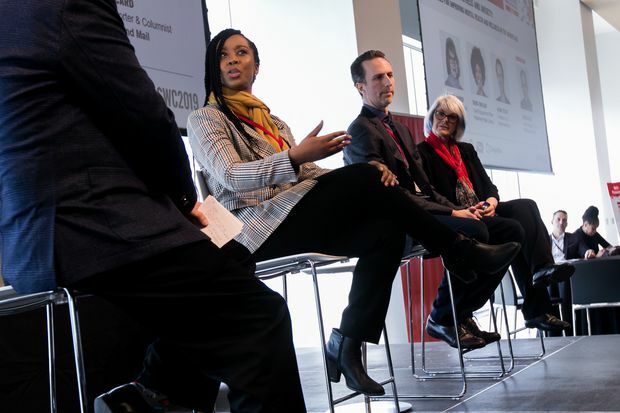 Handling stress was the topic of a discussion/panel at the Solving Workplace Challenges summit during the 2019 Employee Recommended Workplace Awards event, created by The Globe and Mail and Morneau Shepell and presented on March 19 in Toronto. Other panelists featured in the discussion on managing employee stress and anxiety say adopting strategies for incorporating stress reduction, self care and overall wellness throughout the workplace are key to handling and preventing crises. For panelist Shelley Parker, an industrial psychologist at NB Power, enforcing mindfulness through all levels of the corporation has, quite literally, prevented injury and saved lives. Dr. Parker says staff at NB power are most prone to physical accidents during company-wide transitions, when their jobs feel out of their control, which can affect their concentration on the work at hand. Teaching staff mindfulness techniques has helped to combat this. So, after getting the company’s leadership on board with her strategy, Dr. Parker went into the field to teach staff at NB Power a three-step breathing technique that they can do at any time – in teams or alone, on the job or at home – to check in with themselves, reduce stress and become present in the moment. She also trained crew leads in embedding check-ins into the workflow, to ensure that every employee feels present and prepared to be on-the-job each day. And these strategies have worked: After adopting them across across the company, NB Power went a record two years without experiencing any employee incidents, Dr. Parker says. Panelist Jason Tafler, founder and CEO at Unyte, agrees that strategies for self care and mindfulness are essential to a healthy, productive workplace. In fact, it was a lack of regular self care amid working 80- to 100-hour weeks as an EVP at Rogers Communications that led his health to diminish. After he was hospitalized one workday due to bleeding from a condition he soon learned was Crohn’s disease, an inflammatory bowel disorder that is exacerbated by stress, he quit his job to pursue a more balanced lifestyle and, eventually, start the mindfulness training company he runs today. Whether it’s breathing routines and meditation or self check-ins and gratitude exercises, Mr. Tafler says adopting mindfulness techniques are one key way to shift the culture around productivity in the modern Canadian workplace. For staff at the Pickering Library, wellness takes a variety of ever-changing forms – the diversity of which Ms. Sinclair says has been essential to their uptake rate. By offering programs ranging from regular group walks to employee wellness surveys and therapeutic colouring, the library ensures that every employee will be able to find at least one program that works for them. Ms. Sinclair also says the uptake rate of wellness strategies across the body of staff at Pickering Library has been high because it is employee-driven. Rather than using a top-down approach to implementing new wellness initiatives, the library has a committee of staff across all levels which takes this on.